Go ahead. Touch it. You know you want to. Its unique touchscreen lets you glide through HD video like never before. 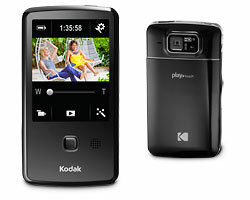 That’s the beauty of the KODAK PLAYTOUCH Video Camera. 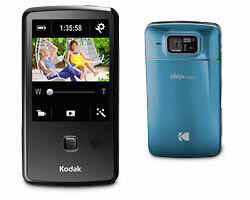 It puts the high-end features you want right at your fingertips. With on-screen editing, you can easily keep the moments you want and trim the ones you don’t. And when you’re ready to turn today’s escapades into tomorrow’s buzz, getting them online is easier than ever. Just press the Share button and your videos are automatically ready for the Web. 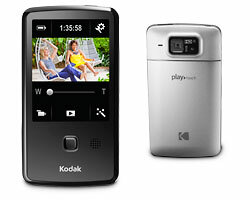 With the KODAK PLAYTOUCH Video Camera, the power to be seen is as simple as touching a screen. The real KODAK MOMENT happens when you share. AUDIO-TECHNICA’s newscaster-style omnidirectional ATR3350 microphone is engineered for intelligible, accurate voice reproduction for your KODAK Zi8 or PLAYTOUCH Video Camera. 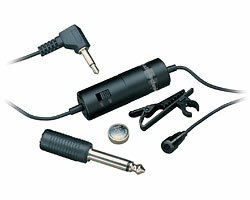 This high-quality microphone is ideal for video use, and is a favorite choice for aerobics/dance/sports instructors. Its low-profile design assures minimum visibility.